Photographix offers complete digital design and production services. 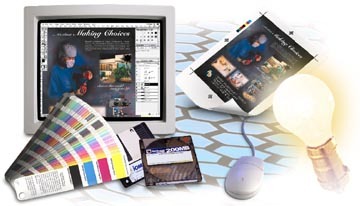 Our designers can create custom logos, illustrations, photo-composites and more. Our in-house photo studio specializes in small product photography. We can photograph your products, scan, color-correct, sharpen and enhance with digital effects, delivering digital images on CD-Rom produced to the exact specifications required for your project. Photographs can be digitally edited to remove unwanted elements, change or add product logos and colors, add backgrounds or color layers that blend multiple image elements together. We specialize in creating high resolution photographic compositions that give your company's exhibit a rich, uncompromising professional corporate image.